In part 1 of this series, I drew a comparison between a car colliding with another vehicle, and companies colliding with growth. (Read part 1 here). The key to avoiding a collision is effective, capable leadership. As the company grows it becomes a necessity for the CEO to surround himself/herself with leaders who can mobilize talent, develop and execute strategy, while staying aligned with the company’s vision, mission and values. I’ve determined four leadership skillsets that consistently show up in companies who effectively adapt to growth. They are: Visionary Leadership; Cultural Leadership Strategic Leadership; and People Leadership. In this post I will tackle Visionary Leadership, because the vision of the company paves the way for everything else on the list! Why is the Vision Important? The vision is a guiding compass. It’s a target – way out in the distance that you continually aim for. The vision for my Dad that night was to steer his car through the streets of Tacoma, onto I-5 South, then ultimately into his driveway (see part 1). Your corporate vision is aspirational. It describes what your company can be at it’s very best. I’ll use Umpqua Bank as an example. Their vision statement is “The World’s Greatest Bank”. Now, are they really “The World’s Greatest Bank”? They believe they can be, and they talk about themselves as if they are. That’s the power of a unifying vision. Although it may appear audacious, and even unattainable, it keeps everyone working to become the best they can be. Vision creates excitement, alignment, and motivation. The vision guides the formation of your mission, values and strategy. If you’ve yet to develop, or need to clarify your vision, I’d suggest you take time to work through it (you should get help with this). Only when you’ve established the vision will you have the foundation for your mission and values. Visionary leadership will keep you from colliding with growth. These are the people who dedicate themselves to the fulfillment of the vision. A visionary leader is constantly focused on the future. They are not bogged down with the operations of the day, but instead look for what’s next. They are consumed by the vision, they formulate the strategies, and they put the people in place to get the company to the next level. Visionary leaders are inspiring! They motivate others to see the vision for the company and they instill belief that the vision will be achieved. 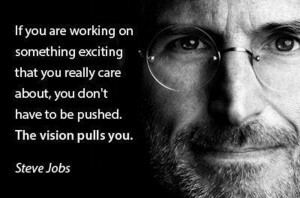 Visionary leaders are driven and passionate. They believe in the vision and want to see it realized. So now you know the first step in avoiding a collision with growth. Develop (or clarify) your vision, and be sure you have visionary leaders on your team. Be on the lookout for the next post in the series where I’ll discuss the 2nd critical leadership skill, Cultural Leadership. Does your company have an aspirational vision? How does the vision motivate you? How are you keeping the vision in front of your team members? Let’s have a dialogue. Please share your feedback with me, and others!